HOPPY WOKE UP BRIGHT AND EARLY. HE WIGGLED HIS NOSE AND SNIFFED THE AIR. "PERHAPS TODAY'S THE DAY," HE THOUGHT. BUT AT THE TOP OF HIS HOLE, HE SAW THAT THE WORLD WAS COVERED IN SNOW. "TOO COLD!" HE SAID AND HOPPED BACK TO BED. When Hoppy finds snow and ice outside, he opts to sleep in. But then, one morning everything has changed. His twitchy nose notices a change as he sniffs fresh warm air and green grass. "TODAY IS THE DAY. THE DAY THAT SPRING ARRIVES!" Hoppy hops out and his senses are overwhelmed by everything! There are pink blossoms on the formerly bare tree. Young ferns are unfurling, and Hoppy hears birds calling instead of the muffled quiet of winter. He smells sweet flowers, tastes the fresh grasses, and sees young lambs springing about the meadow. The pads on his paws feel the warmth of the earth. Spring has definitely sprung! Hoppy hops up to the crest of the big hill to look for his bunny buddies, but at first he sees only brown smudges among the flowers and grasses. Where is everybody? Helloooo? 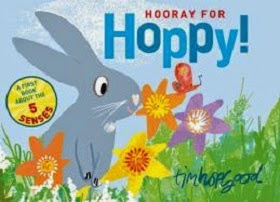 But up they hop, dozens of brown bunnies, in the appropriately surnamed Tim Hopgood's Hooray for Hoppy! (Farrar Straus and Giroux, 2014), which doubles as a signs-of-spring bunny tale and an exploration of the five senses story, just the kick-off for a lesson on the many changes to be experienced in spring for the preschool set. Hopgood's illustrations are suited to his young audience--flat, textured pastel collages done in a spring-y palette--but with a twist, with Hoppy himself in blue and the morning sky in pink. A good readaloud to inspire a looking-for-spring walk or preschool seasonal class activities. The author appends a double-page spread covering the five senses and recall questions such as What does Hoppy smell? And if spring is slow in coming, Kirkus Reviews suggests that this one is..."just the ticket for a little bit of learning on a cold winter day when spring seems far away."